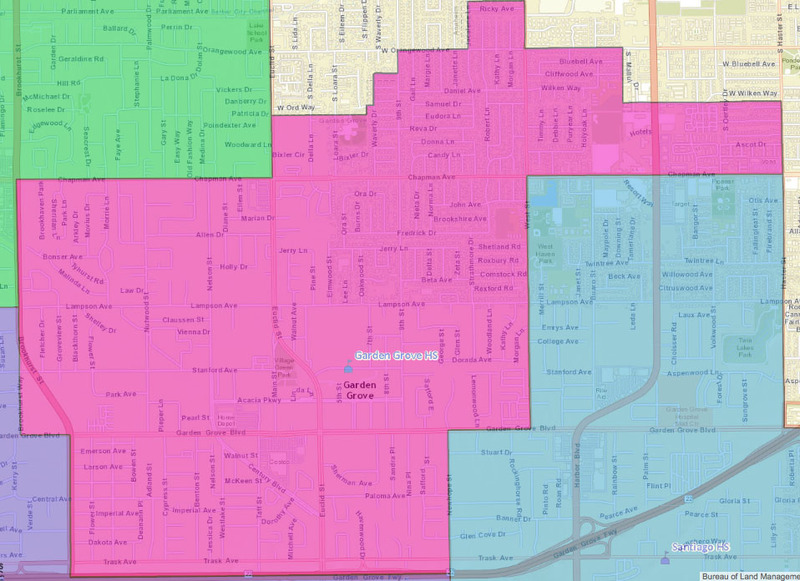 Q: I'm not sure if we live in Garden Grove High School's attendance boundary. How do I find out? A: Quick check: See this map ﻿(switch the "Boundaries" setting in upper right to 'High Schools'); here's a screenshot of the map. OR, on the map page, type in your address in the box at upper left and hit Return; you will get a "popup" showing the elementary, intermediate, and high school for your address. Q: We have moved into your attendance area but do not have the requested documents as proof of address (our landlord pays the utilities, etc.). How can we prove we moved into your area? Gather supporting documents (mail you receive at your address, lease agreement, etc.) or contact Student Services at (714) 663-6391 for more information on what they need to issue a Residency Affidavit. Bring the completed form (signed off by the District Office) to Garden Grove High with your other registration documents. Q: We do not live in the Garden Grove High School attendance area but want to attend your school. How do we do this? A: If you do not live within our attendance boundaries the only way to enroll at GGHS is to obtain a transfer. Either from one of our sister schools or from your district of residence. The district only opens for transfers during the months of March and April. Please refer to our New Student Enrollment section for transfer information. Q: Can anyone register a student, or does it need to be a parent/guardian? A: A parent or guardian must be the one to register the student unless the student is 18 years old, in which case they may register themselves. Q: I am the student's aunt (or uncle, sister, grandma, etc.). Can I register the student? Through the State of California (for complete guardianship). Click here to be taken to the state website with further information. Through the Garden Grove Unified School District (as a caregiver). This link explains the Caregiver Affidavit and alternatives to complete guardianship. You may complete the form through the state website or you may go to the Garden Grove District Office and request one. Please contact Student Services at (714) 663-6391 for information on what they need to issue a Caregiver Affidavit.